This is my 22 month old GSD, his name is Banjo. He was born in Phnom Penh Cambodia. We moved back to the states a few months ago and he LOVES Northern California! Holly what a beautiful GSD and picture. That is a stunning picture, should be hanging on a wall somewhere. He is just beautiful. Getting him here from Cambodia had to be quite the trip. He is very beautiful. 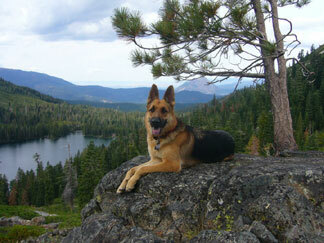 I wish you many years of unconditional love and devotion only a German Shepherd Dog can provide.